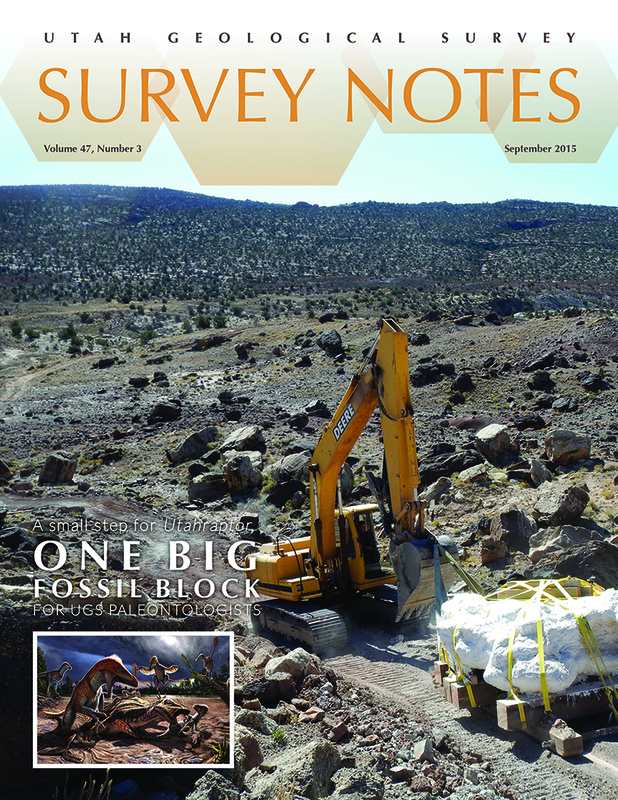 Survey Notes September 2015 Issue is Out! Our latest issue of Survey Notes is out! Check it out on our Survey Notes Gallery HERE. 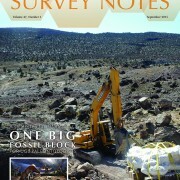 https://geology.utah.gov/wp-content/uploads/SNTS_47-3_Sept2015_Cover.jpg 1000 773 Utah Geological Survey https://geology.utah.gov/wp-content/uploads/ugs-logo-large.png Utah Geological Survey2015-09-22 08:32:452016-08-10 16:36:10Survey Notes September 2015 Issue is Out! Happy Friday! 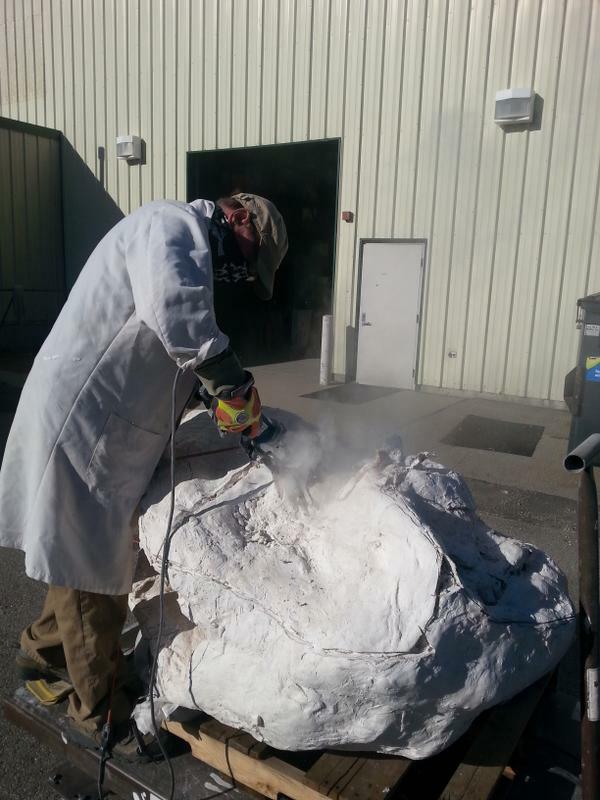 Take a minute to enjoy Discovery Canada’s short on our Paleontologists here at the Utah Geological Survey and their work on the nearly 9-ton fossil block containing a family of Utahraptor. 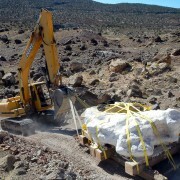 See James Kirkland, Scott Madsen, Don DeBlieux, and help from others as they unravel their Utahraptor puzzle. 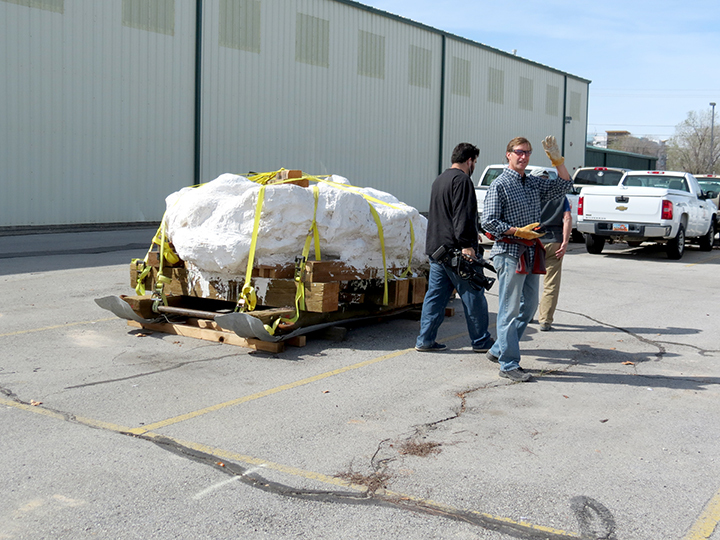 A BIG BIG “Thanks” to Cross Marine Projects of American Fork for helping us move our nearly 9-ton Utahraptor fossil block from our UGS headquarters in Salt Lake City down to Thanksgiving Point’s Museum of Ancient Life in Lehi today. 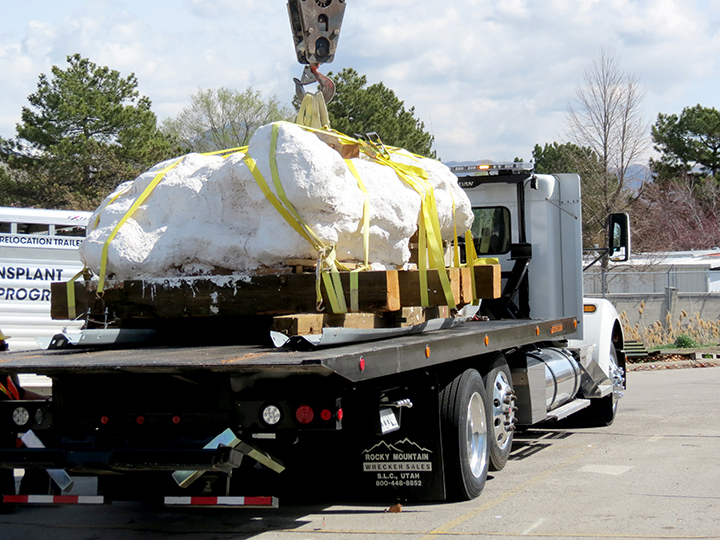 Salt Lake City – March 17, 2015 – The Utah Geological Survey (UGS) has signed an agreement with Thanksgiving Point Institute to extract and prepare the fossils of a pack of Utahraptors encased in a nine-ton sandstone block. Utahraptors are the oldest known dromaeosaurids, or bird-like therapod dinosaurs. They resemble Steven Spielberg’s Velociraptor from the movie Jurassic Park, but are much larger and believed to be a more ferocious predator. 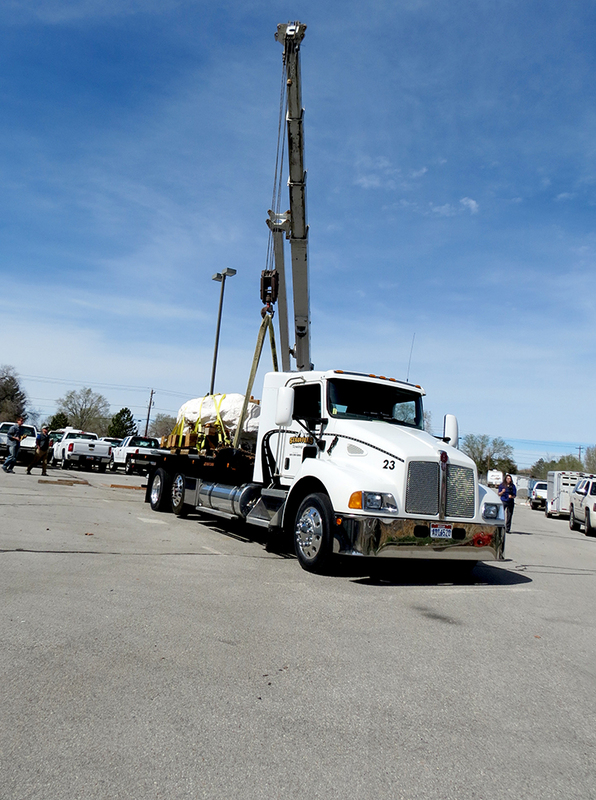 On Wednesday, March 18th, Cross Marine Projects of American Fork will generously donate their services to relocate the sandstone block from the Utah Department of Natural Resources (DNR) in Salt Lake City to Thanksgiving Point’s Museum of Ancient Life in Lehi. 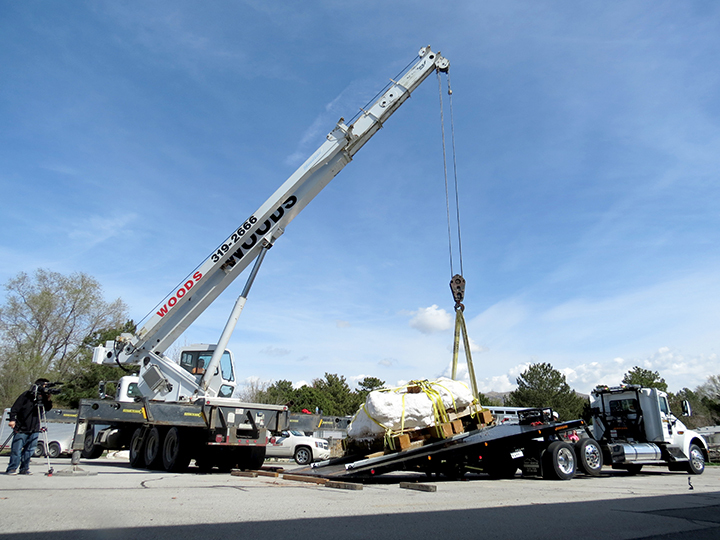 Upon securing the necessary funding, one of the world’s top micropreparators, UGS geologist Scott Madsen, and his colleagues may spend up to five years preparing the fossils in the museum’s paleo lab, begining as early as May. The museum’s paleo lab has a public observation room and will be equipped with video microscopes to feed video footage into the museum. This public access will give museum visitors an educational opportunity to see firsthand the extensive detail and care paleontologists use to prepare fossils. Preliminary analysis of the 125 million year old sandstone indicates the block contains the remains of at least six, and possibly many more, Utahraptors, including one adult, four juveniles, and one baby. Preservation within the block appears exceptional, lending to the hope that details such as feather impressions may be preserved. Bones of at least two iguanodont dinosaurs were also discovered within the sandstone block, leading Utah paleontologists to believe the Utahraptors were hunting when they became mired in quicksand, buried, preserved, and fossilized. 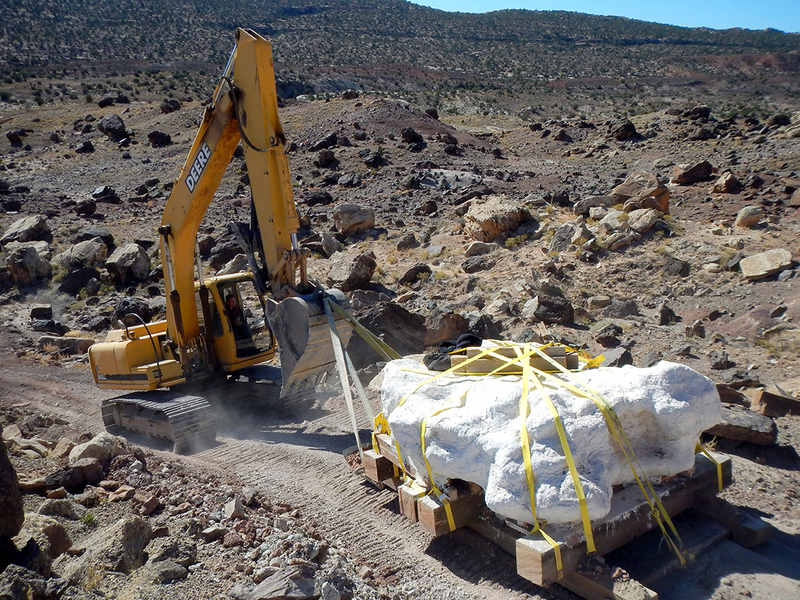 UGS paleontologists originally extracted the mega-block from the Stikes Quarry, which is located on Utah State land in east-central Utah, north of Arches National Park. Matt Stikes, a former graduate student at Northern Arizona University, discovered the site and reported it to the UGS in 2004. 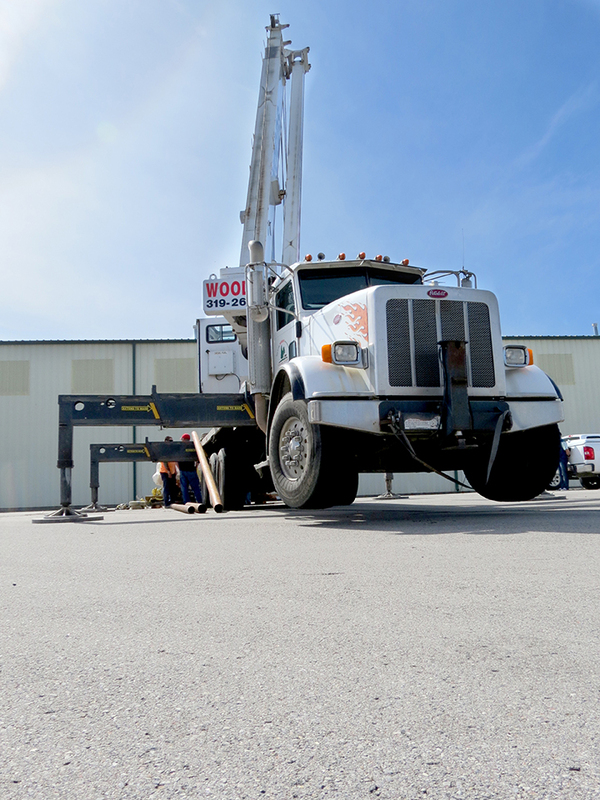 Last year Cross Marine Projects donated their services to recover the nine-ton block from its steep hillside location and move it to DNR. 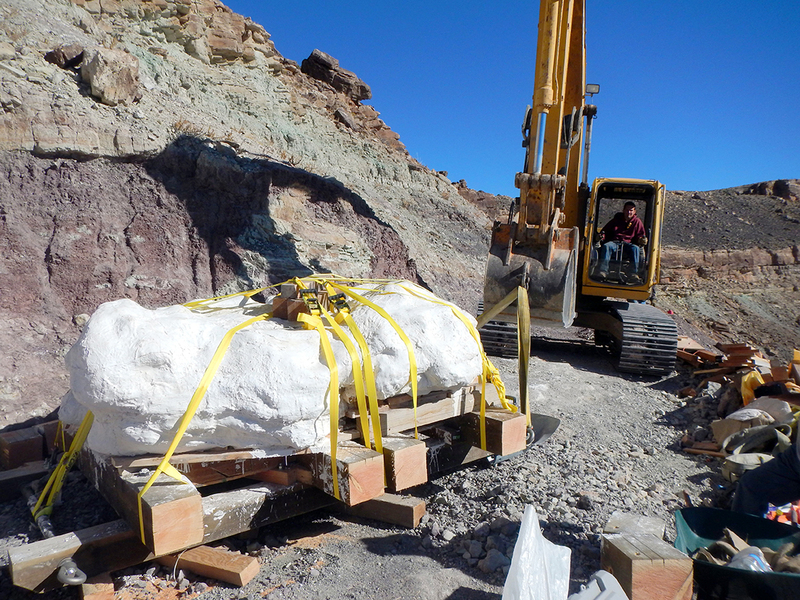 All fossils within the block are owned by the State of Utah and after preparation, their final repository will be with the Natural History Museum of Utah. 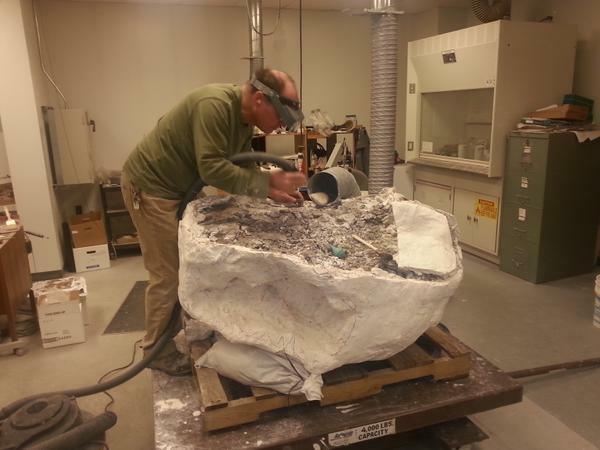 UGS paleontologist Scott Madsen cutting the plaster jacket off of the bottom of a block from the Stikes Utahraptor excavation. 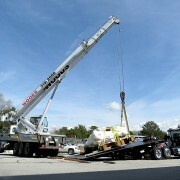 This roughly 1,000 lb block, dubbed “The Mushroom”, and containing the remains of Iguanodont and Utahraptor dinosaurs, was collected from on top of the large 18,000 lb. block of dinosaur fossils that was dragged off of a mesa in eastern Utah in the fall of 2014. 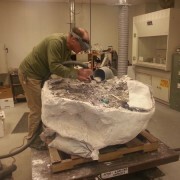 Scott Madsen begins the preparation of “The Mushroom” in the UGS paleontological laboratory. Inside a nine-ton sandstone block pulled from a mesa outside of Moab could be the key to knowing how the carnivorous Utahraptor lived. But before paleontologists can figure that out, State Paleontologist James Kirkland says they are going to have to find a place where they can start chipping away at the block. Paleontologists have unearthed the largest trove of fossils ever discovered from Utahraptor, a feathered dinosaur. 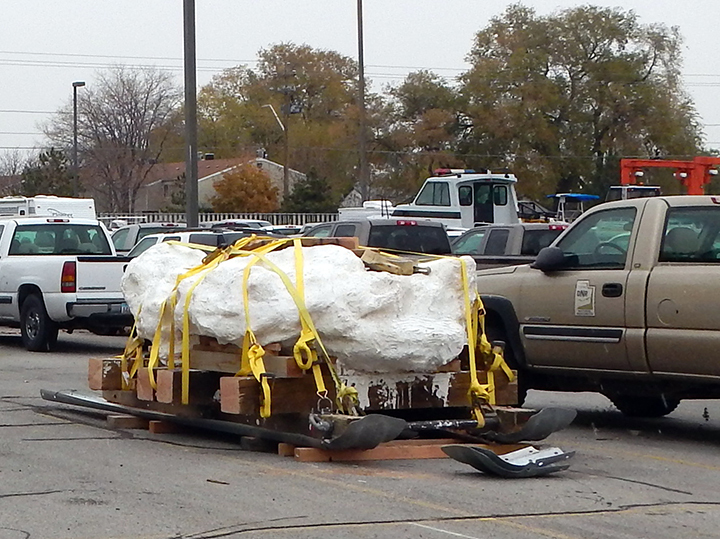 According to the paleontologists, the fossils of six Utahraptor dinosaurs were trapped in a block of sandstone.